I had experimented with gluten-free flour mixes without success until I tried King Arthur brand, a combination of white rice flour, tapioca starch, potato starch, and brown rice flour. These hamantaschen are whiter in appearance than typical hamantaschen. In addition, you need to bake them until they are browner on the bottom. Wait until they cool before eating them because they are too crumbly when they’re still warm; they are much better after they harden up. In a large bowl, whisk together the eggs, sugar, oil, and vanilla and mix well. Add the baking powder, xanthan gum, and flour mix and use a wooden spoon to mix until the dough comes together. Cover the bowl with plastic wrap and leave in the fridge for one hour to firm up. Preheat oven to 350°f (180°c). Line two large cookie sheets with parchment paper or silicone baking mats, or plan to bake in batches. Divide the dough in half. Take two pieces of parchment paper and sprinkle some gluten-free flour mix on one, place one dough half on top, and then sprinkle a little more of the mix on top of the dough. Place the second piece of parchment on top of the dough and roll on top of the parchment until the dough is ¼ -inch (6-mm) thick or thinner. These cookies come out best when rolled thin. Every few rolls, peel back the top parchment and sprinkle a little more flour on the dough. Use a 2- to 3-inch (5- to 8-cm) drinking glass or round cookie cutter to cut the dough into circles. Use a metal flat-blade spatula to lift up the circle of dough and place it on another part of the flour sprinkled parchment paper. 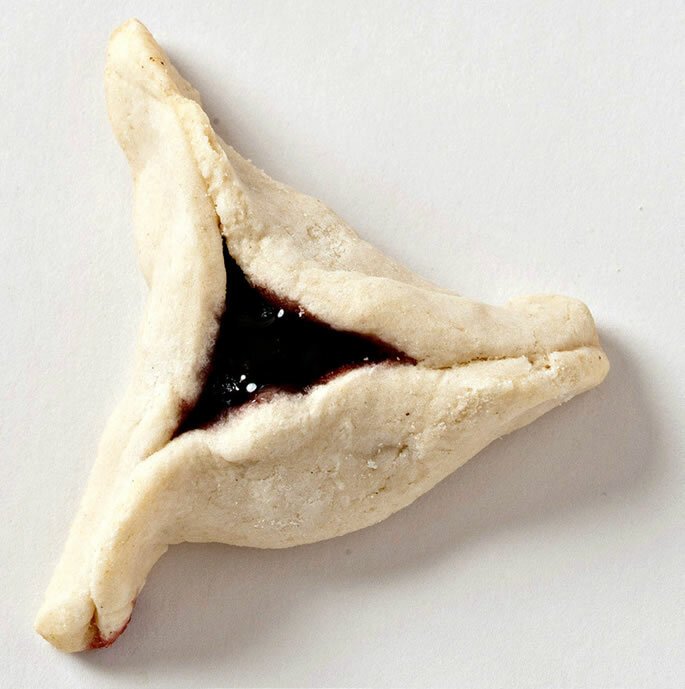 Place up to 1 teaspoon of jam in the center of the dough circle and then fold the three sides in toward the middle to form a triangle, leaving a small opening in the center. Pinch the three sides together very tightly. Place on the prepared cookie sheets. Repeat with the Remaining dough and roll and cut any dough scraps, making sure to sprinkle a little flour under and over the dough before you roll. Bake for 18 to 22 minutes, or until the bottoms are browned. Let the cookies cool completely on the cookie sheet. Store in an airtight container at room temperature for up to five days or freeze for up to three months.